What a 75th birthday party. This week in Los Angeles, a collection of the musical elite gathered to celebrate and pay tribute to Saskatoon-raised Joni Mitchell, one of the most influential artists of our time. But among all that star power was a childhood friend from Saskatoon, who personally delivered a cultural honour gifted to Joni Mitchell in the form of a traditional Saulteaux name. 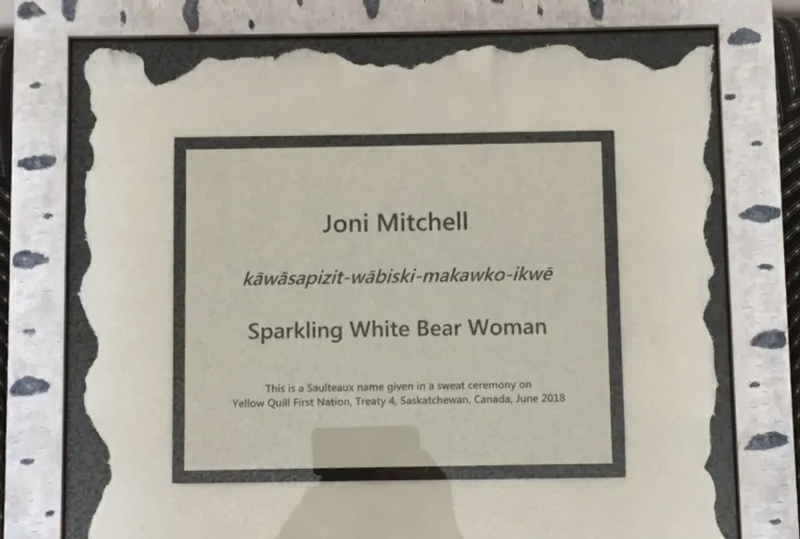 For the Yellow Quill First Nation, Joni Mitchell is Kāwāsapizit-Wābiski-Makawko-Ikwē, or Sparkling White Bear Woman. "The feeling in that theatre and the numbers of people and the intergenerational aspect of the audience and the singers who have all obviously been influenced by Joni, it was just absolutely wonderful," Sharolyn Dickson said in an interview with CBC Radio's Saskatoon Morning. Dickson and Mitchell became friends when they were little girls attending school together in Saskatoon, and it was her job to deliver the traditional Indigenous name - a responsibility that was handed to her at the naming of the Joni Mitchell Promenade earlier this year. "I received that as her designate, and it was my job then to place it in her hands," said Dickson. Despite the distraction of a star-studded 75th birthday celebration, Dickson said the honour from the Yellow Quill First Nation was humbly accepted by Mitchell with gratitude and respect. "She's always been such a huge advocate of First Nations culture and it has been a strong interest of hers for years and years." The two lifelong friends are now working on the proper Saulteaux pronunciation of the name. "She wants to learn how to say it correctly," said Dickson. This article has been viewed 805 times since being added on November 10, 2018.